The new Campus North Residential Commons, scheduled to open at the start of the 2016–17 academic year. Campus North Residential Commons to include Boyer House. The Campus North Residential Commons, scheduled to open in fall of 2016, will have eight new house names honoring University alumni, supporters and Dean of the College John W. Boyer. 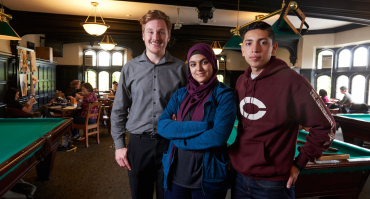 College houses are a distinctive part of the University of Chicago College experience, offering a community of peers who live, study and build lasting friendships together. Campus North was designed with College houses in mind, including multi-level lounges for each house and space for the senior faculty members who will serve as resident masters. In March, the University announced that the adjoining dining commons would be named the Frank and Laura Baker Dining Commons, recognizing University Trustee Frank Baker, AB’94, and his wife, Laura Day, for their support of undergraduate scholarships and internships for lower-income students of outstanding promise. Dr. Robert A. Behar House, named for Robert A. Behar, LAB’81, AB’83, MD’87, MBA’11. Behar is the chairman and CEO of North Cypress Medical Center in Cypress, Texas. A member of the College’s Visiting Committee, Behar has generously supported the College’s career exploration and preparation programming. John and Barbara Boyer House, named for John W. Boyer, AM’69, PhD’75, dean of the College and the Martin A. Ryerson Distinguished Service Professor of History, and his wife, Barbara Boyer. John Boyer is the longest-serving College dean in the University’s history, having served for the last 24 years. Enhancing residential life as an essential part of students’ intellectual experience has been one of Boyer’s major goals as dean. Fifty members of the College’s Visiting Committee made gifts to the Metcalf Internship and Odyssey Scholarship programs to name Boyer House in his honor. Brady W. Dougan and Laura E. Niklason House, named for University Trustee Brady W. Dougan, AB’81, MBA’82, and Laura E. Niklason, PhD’88, longtime supporters of the College, who have given generously to the Jeff Metcalf Internship and New Leaders Odyssey Scholarship programs. Rogers Family House, named for University Trustee John W. Rogers Jr., LAB’76, and his parents, John W. Rogers Sr., JD’48, and Jewel Stradford Lafontant, JD’46. In naming Rogers House for his family, John Rogers Jr. honored the groundbreaking contributions of his late parents. John Rogers Sr. earned a Congressional Gold Medal in 2007 for his service as a member of the Tuskegee Airmen during World War II. One of the few African American law students in the country in the 1940s, he founded a law firm with Stradford Lafontant and had a long career as a juvenile court judge. Stradford Lafontant was the first African American woman to graduate from the University of Chicago Law School and the first African American to serve as deputy solicitor general of the United States. John Rogers Jr. has been a tireless supporter of the Laboratory Schools and the Law School, and has been a proponent of the University’s efforts to increase partnerships with minority businesses. Alexis and Steven Strongin House, named for Steven H. Strongin, AB’79, AM’82, and Alexis Strongin, AB’80, SM’82, MD’84. 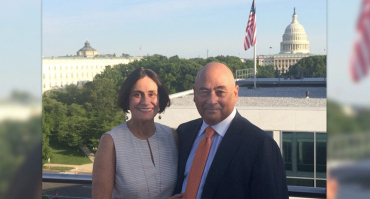 The Strongins have a history of support for the College: The couple created the Strongin Family Fund For Students with Financial Need to support Odyssey and middle-income students with summer internships in the not-for-profit sector or research abroad, as well as programs at the Pritzker School of Medicine and the University of Chicago Medicine dedicated to improving health in urban communities. Both Strongins are life members of the College Visiting Committee, and Alexis Strongin serves on the Biological Sciences and Pritzker School of Medicine’s Visiting Committee. Immanuel Thangaraj House, named for Immanuel Thangaraj, AB’92, MBA’93. A scholarship recipient and former International House resident, Thangaraj is a dedicated UChicago volunteer. He has hosted career treks for undergraduates in Silicon Valley and helped lead giving efforts for his College and Chicago Booth reunions. He is also a member of the College’s Visiting Committee and co-chair of the Council on Chicago Booth. Tina and Byron Trott House, named for University Trustee Byron D. Trott, AB’81, MBA’82, and his wife Tina Trott. Byron Trott may be best known at UChicago for founding the Metcalf Internship Program, which provides paid, substantive internships exclusively for UChicago undergrads, currently placing some 1,700 students in summer or academic-year internships around the world. 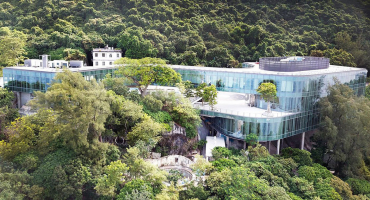 Francis and Rose Yuen House, named for University Trustee Francis Yuen, AB’75, and his wife, Rose Yuen. The Yuens have supported scholarships and fellowships for international and graduate students and the University’s Centers in Beijing, Hong Kong and Paris. They also established the Anthony C. Yu Dissertation Fellowship, which supports the work of a student in comparative religion and literature in the Divinity School or the Division of the Humanities. Located at 55th Street and University Avenue, Campus North Residential Commons will be an inviting entry to the campus, connecting the University with the Hyde Park community to the north. Studio Gang Architects, led by renowned Chicago architect Jeanne Gang, tailored the space to UChicago’s College houses. Each of the eight houses will accommodate about 100 students, and will offer double and single rooms, as well as apartment-style accommodations with kitchens for upperclassmen seeking a more independent living experience. A three-story lounge in each house will serve as a central gathering point for students to relax, study and socialize. Campus North also will feature a 15th-floor reading room with lakefront and University views, music practice rooms, study rooms, two residential courtyards, two common rooms for programs and events, and two classrooms. 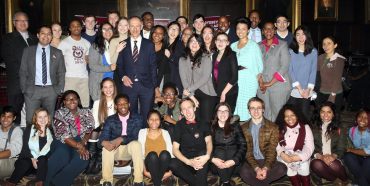 Gift from Harriet Heyman, AM’72, and Sir Michael Moritz supports Odyssey program with more financial aid, internships, and college prep for students in need.